(Bill Lewis , For The Tennessean. Click HERE for full article) Mary and Zach Jeppesen’s new townhome in Franklin’s Shadow Green subdivision is almost twice the size of their old apartment, but they’re happy one thing is smaller — their electric bill. “I’m getting twice the square footage for half the energy bill,” said Mary Jeppesen. Goodall Homes, the home building company that developed Shadow Green, includes energy saving features in all of its new homes. That’s a step taken by many builders in Williamson County in response to growing consumer awareness of the cost of heating, cooling and lighting a home. A survey by the National Association of Realtors (NAR) found that 11 percent of buyers bought a new home for its green and energy efficient features. That number was higher — 14 percent — for buyers between the ages of 36 and 50. For buyers under age 35, it was 13 percent. “I thought that was low. All of our clients ask about it,” said Derenda Sircy, sales manager for Regent Homes. They are especially interested in hearing about monthly savings that add up over the years of owning a home, she said. The NAR survey found that of those home buyers actively seeking green features, 84 percent thought heating and cooling costs were important. Other features considered important were energy-efficient appliances and lighting (67 percent), landscaping for energy conservation (47 percent), and environmentally friendly community features (44 percent). Regent’s houses feature programmable thermostats, Energy Star appliances and ceiling fans, compact fluorescent lights, LP TechShield roofing, high efficiency heating and cooling systems and advanced construction materials and techniques. All of Regent’s homes are tested by an independent company to ensure tight construction and a good Home Energy Rating System (HERS) score. Sircy estimates that an 1,800-square-foot townhome would have a monthly utility bill of less than $100. “It’s an enormous amount of savings,” she said. 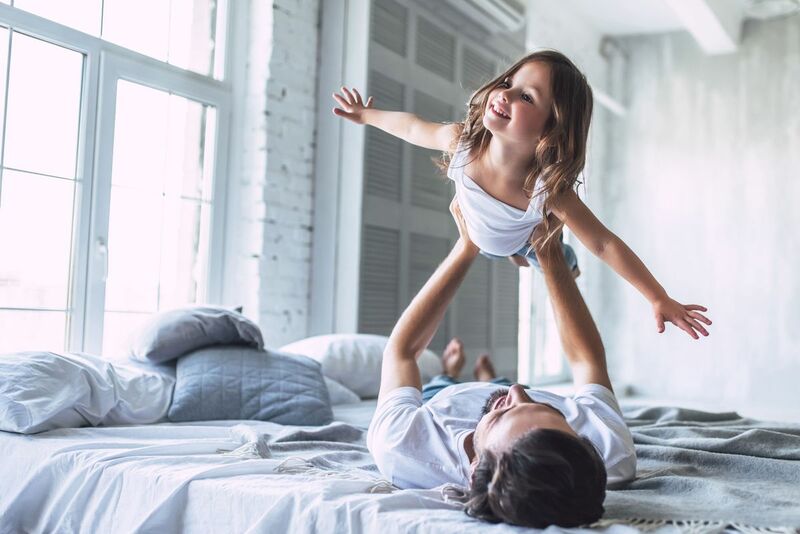 At Pulte Homes, which is building in Franklin’s Amelia Park subdivision, energy-efficient features include radiant-barrier roofing that keeps attics cooler, high efficiency heating and cooling systems, programmable thermostats and tankless water heaters. “Pulte homes can be up to 30 percent more energy efficient than the average existing home, resulting in lower cost,” said spokesman Valerie Dolenga. The Jones Co. offers the option of interior walls built with materials that filter allergens and pollutants from the air, but it’s an upgrade that not a lot of buyers have purchased. All the company’s homes come with low VOC paint and carpets and a passive radon vent. Energy saving features include conditioned crawl spaces, radiant barrier roofing and advanced building techniques. Homes come with high-efficiency heating and cooling systems. “We are one of the only larger companies that still does two units on a two-story house, which is a big deal,” said Jen Lucy, director of sales. 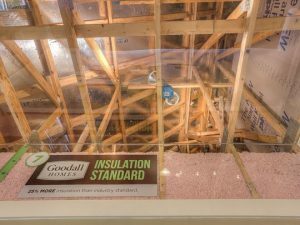 So many of Goodall Homes’ customers wanted to know about energy-saving features that the company built what it calls an Energy Room at its model home in Franklin’s Waters Edge subdivision. “People can see behind the walls and see the energy-saving elements,” said Rachael Overall, the company’s director of marketing. Those features include LP TechShield roofing, Energy Star insulation, low E windows, air barriers in the attic, sealed ducts and advanced framing techniques. Other features include programmable thermostats, CFL lighting and Energy Star dishwashers. 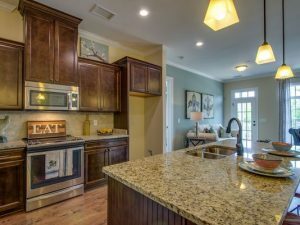 Mary Jeppesen, who works in sales for the company, bought her Goodall townhome after becoming familiar with those features while assisting clients. “A lot of people ask about energy efficiency,” said Jeppesen. “They might live in an apartment or older home with high bills. Not only will their energy bills be lower, it’s a lot more comfortable in the house.” Their average monthly bill used to be around $200. “Not only is the energy bill lower, it’s more comfortable,” said Mary Jeppesen.